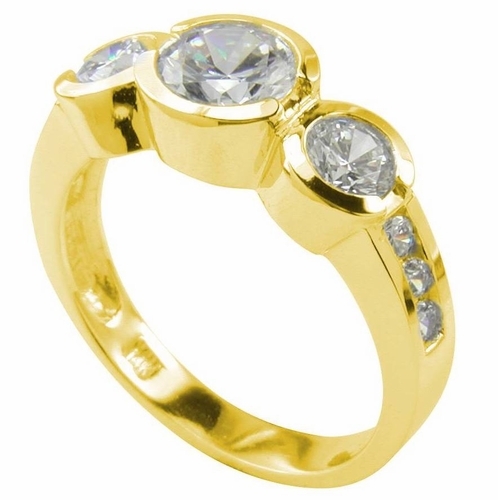 Our Ora Three Stone Round Bezel Set and Channel Set Cubic Zirconia Anniversary Ring features a high quality 1 carat round brilliant 58 facet diamond look cubic zirconia center stone. 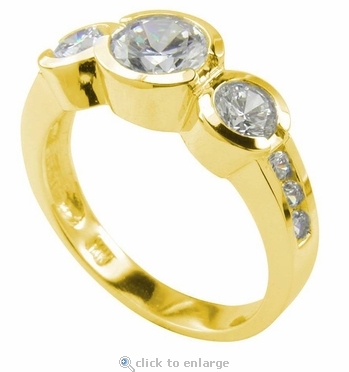 This three stone anniversary ring sports "C" shaped semi bezels that add a unique design element to the setting style. It has a 1 carat 6.5mm man made diamond look cz center stone followed by .50 carat 5mm round sides and an additional row of cubic zirconia rounds channel set down both sides of the shank. This three stone anniversary ring boasts a total carat weight of 2.25 carats of the finest lab created diamond simulants available. 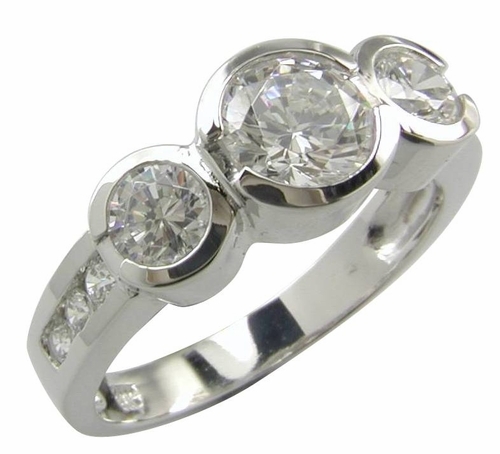 Match this ring with a channel set round anniversary band or eternity band for an awesome wedding bridal set. All Ziamond cubic zirconia includes a lifetime warranty against cracking, chipping, fading or losing brilliance. Please see our policies page for full details. Due to extremely low pricing, all clearance sales are final. Clearance items may be sized for an additional fee of $35. Simply type in your request in the comment box at the end of the order. Sizing below a 5 or above an 8 is subject to additional fees. Please call for a quote.